The 2018 Women in the World (WITW) Summit in New York City had a panel called “Emotional Money.” It started with the statistic that 8 out of 10 women will be on their own at some point. I muttered to myself, “I’m on my own now and I’m rocking it.” As I listened to the speaker I started to suspect that I am not the norm—a woman who has always handled her own finances even when in a relationship. The more I read about women and personal finances, the more convinced I become. All relationships have some division of labor. One half of the couple excels at something so they take on that responsibility while the other half has little to do with it. There’s nothing wrong with that, in fact, it makes good sense. Why would I manage the contractors for home repair if I know less about construction than my partner? And why would I let my partner handle our insurance when I have over a decade of experience in healthcare? There are some aspects of partnership that should not be divided, however—like finances. As the 8/10 statistic shows, women are likely to be forced to know their own finances at some point. Even if your relationship lasts, women usually live longer than men and the last thing you want to do when you’re 75 years old is start figuring out where you stand financially. But managing or at least understanding your own finances is more than just good planning—it’s a safety issue. If you aren’t familiar with your financial situation or haven’t developed the skills to manage your finances, you are incredibly vulnerable. According to a study done by the University of Wisconsin-Madison, financial abuse is present in 99% of domestic violence cases. Women often cite finances as a primary reason they remain in an abusive relationship. If you don’t know how to support yourself, how can you leave? It puts your partner in a position to cheat, neglect, or abuse you while you have fewer escape options. Even if you don’t think your partner is the kind of person who would abuse you or manipulate you with money, you may at some point want to leave the relationship. If you have a good understanding of what you earn, spend, have, and owe you will have a much easier time starting your new single life. Most of the articles I read about women and finances were about steps women can take to be more informed about their financial situation. They were focused on the ways that individual women should change their behavior. This blog is attempting to convince you of that as well—we each need to take responsibility for our finances for the reasons I’ve outlined. But this focus reminds me of Sheryl Sandberg’s Lean In. It only gets at part of the picture—the part that requires women to do the work of changing and ignores the system changes that are also needed. So while I am certainly encouraging women to take personal responsibility for knowing their finances, I am also hoping to draw attention to the ways in which our society encourages them not to. A basic google search provided me with countless articles about investing money and financial planning. As I looked through them I noticed a pattern in the way these articles were marketed. The first one I opened, How To Invest Money was written by a man and a woman. I thought this was encouraging until I realized that the picture used with the article was a white man looking at his laptop. Hmmm… maybe this article isn’t for me. Another article I looked at was 10 Long Term Investment Strategies that Work. There were 12 slides and all the people in the slides were men except one group shot of friends cheering for a sporting event in which there were 2 women in the group. Surely there are articles out there with pictures of women managing their finances and certainly women can benefit from articles without pictures of women but these types of articles reflect cultural biases. When women don’t see themselves reflected in society’s images of financial planners they are less likely to see themselves as financial planners. As with most feminist issues, financial equality requires changes at an individual and systemic level. Women need to ensure that they are well acquainted with their own financial situation and in a position to become independent if they need to. 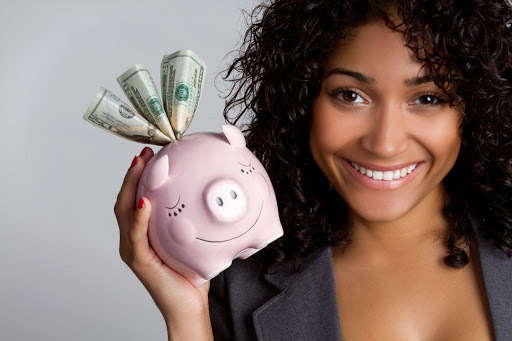 We also need to make sure that our culture shifts so that we aren’t discouraging women from handling their own money. Stop telling girls that math is hard. Stop telling college women to avoid the finance courses. Stop marketing finance and banking tools to men only. Money is power and women are in a constant battle for an equal share of power. One way to get on more equal footing is to develop financial awareness.